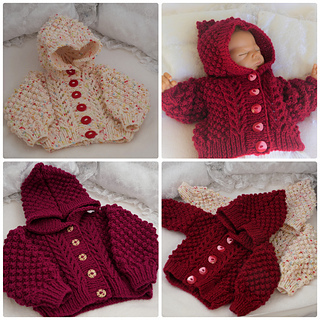 Ideal for an extra warming layer and the perfect cardigan for those all important car trips to Grandma & Grandad’s house. 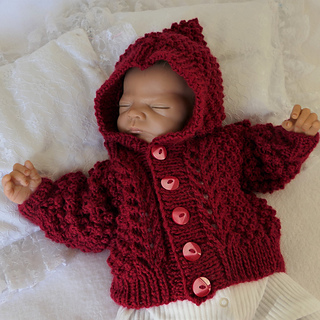 This is a lovely design for a baby girl and features a cute pixie style hood. 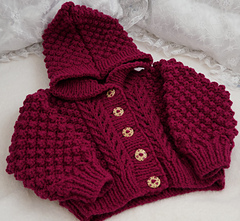 The hoodie is worked flat on two needles and is a relatively quick knit using a combination of Blackberry Stitch with lace panels. 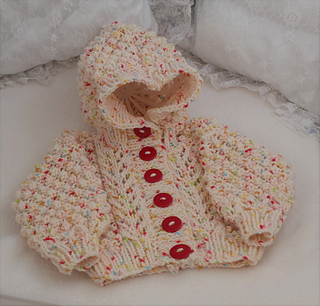 Instructions are given to knit the jacket in sizes 0-6 and 6-12 Months and you will need 2 x 100g balls of Aran weight yarn. 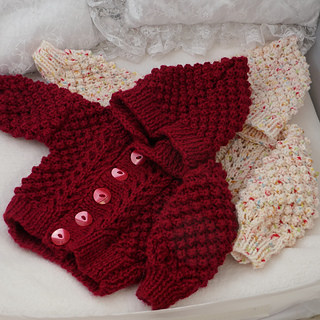 The samples are knitted in Sirdar Aran Raindrops and James C Brett Aztec Aran but any standard Aran weight yarn knitting to the correct tension could be used as a substitute.